Bankruptcy Attorney Melanie Tavare realizes that the prospect of losing a home to foreclosure can be overwhelming and has helped countless clients save their homes from this nightmare through bankruptcy relief. She is skilled in assessing a homeowner’s situation and advising them of their bankruptcy options as a foreclosure defense. If you are behind on your mortgage and wish to keep your home, a Chapter 13 Bankruptcy may be able to help. When you fall behind on your mortgage, the amount of past due mortgage payments are called arrears. In a Chapter 13 Bankruptcy you can put these mortgage arrears in your Chapter 13 plan. This means that over a three to five year period you can pay back your mortgage arrears through your Chapter 13 plan. You make a payment to the Chapter 13 Trustee and the Trustee then disperses a set amount each month to your mortgage company. At the end of your plan, you should be fully caught up on your mortgage arrears. It is important to remember that in addition to making your Chapter 13 plan payment you must also start making your regular mortgage payment again as it becomes due. What If I Can’t Afford My Mortgage? Unfortunately, there is nothing in the Bankruptcy Code that allows the Bankruptcy Court to modify your first mortgage. However, filing a bankruptcy in order to catch up on your mortgage arrears is an excellent, and sometimes the only, choice to save your home from foreclosure. If you can afford your mortgage but fell behind on it due to temporary financial circumstances then a Chapter 13 Bankruptcy may help you save your home. Can a Bankruptcy Stop a Trustee Sale? Yes. Filing for bankruptcy, whether it be Chapter 7 or Chapter 13, triggers an automatic stay which prevents your mortgage company from completing a Trustee Sale without first going into Court and getting permission from a Bankruptcy Judge to finish the foreclosure. If you file for a Chapter 13 Bankruptcy and are paying back your mortgage arrears through your plan and begin again to make your regular mortgage payments on time, your mortgage creditor will not be able to finish the foreclosure on your home. If you file a Chapter 7 Bankruptcy, the automatic stay will prevent the foreclosure of your home for a limited time. Can I Strip Off My Second Mortgage? For many homeowners, a Chapter 13 Bankruptcy can not only eliminate your credit card debt and allow you to catch up on your mortgage arrears, but it can also eliminate your second mortgage as well. Many people do not realize that if your home is lost to foreclosure you may still be on the hook for the balance of your second mortgage. Bankruptcy lawyer Melanie Tavare will discuss the details of stripping a second mortgage with you at your initial free consultation and will work with you to obtain the mortgage relief you are seeking. 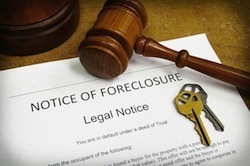 If your home is in foreclosure don’t wait another day to learn about your legal options. Contact the Law Offices of Melanie Tavare for a free bankruptcy consultation.